Park Interpretative Specialist Jenny Comperda reports from Calaveras Big Trees, where 1,160 students from around the world experienced the giant sequoia forest through virtual field trips in March. Congress needs to hear that you support a new bill to protect our national monuments—including Giant Sequoia National Monument—from actions that threaten their natural and cultural resources. The ANTIQUITIES Act of 2019 would reinforce existing laws that safeguard the status of our presidentially designated national monuments. The League needs your help to push for protection of our national monuments. Park Interpretative Specialist Jenny Comperda reports from Calaveras Big Trees, where 950 students from around the world experienced the giant sequoia forest through virtual field trips in February. One hundred and thirty-five days after the Land and Water Conservation Fund (LWCF) expired for the second time in three years, permanent reauthorization passed the U.S. Senate by a vote of 92-8, demonstrating strong bipartisan support for the program. Learn how you can help #SaveLWCF. Park Interpretative Specialist Jenny Comperda reports from Calaveras Big Trees, where 1,000 students from around the world experienced the giant sequoia forest through virtual field trips in January. Help Cover the Internet with Redwoods! You can stand for the redwoods by covering the Internet with these amazing trees in October. We’re calling all people and organizations to join us in sharing the redwoods in enewsletters, blog posts, Facebook, and other social media and using the #Stand4Redwoods hashtag. This is going to be big and fun! As major wildfires burn throughout California, our thoughts are with the affected communities and dedicated firefighters. The area burned by California wildfires has grown in recent years, and in many cases, the fires have been burning hotter than ever. Kristen Shive, the League’s new Senior Scientist, explains how our forests are faring, and how the League’s restoration and forest management efforts can prevent negative consequences of severe wildfires. What determines when shrubs bloom? The study of seasonal life cycle events such as this is called phenology, and gathering long-term data on these cycles is the focus of the California Phenology Project (CPP). Collecting data is simple, and anyone can participate. For the past couple of months, I’ve been tracking some plants in Redwood Regional Park as part of the Redwood Phenology Project by Save the Redwoods League and the East Bay Regional Park District. Election Results: #YesOn68 Means Clean Water and Safe Parks for All! With Prop 68 passed, Save the Redwoods League will be able to improve existing redwood parks and reserves, making them more accessible and more resilient to a changing climate. 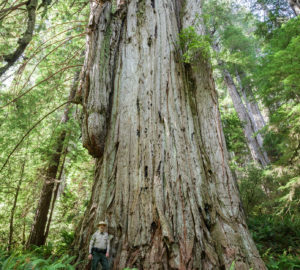 We will also be able to protect the redwood forest footprint from the threats of conversion, development, and wildfire.